The first week of January and all state holidays. For the ultimate Route 66 experience, visit the Oklahoma Route 66 Museum in Clinton. The museum offers visitors a personal journey through the history of the nation’s most revered highway. Encounter the iconic ideas, images, and myths of the Mother Road. Learn about the dreams and the labor needed to make the road a reality. Experience the Dust Bowl as thousands streamed along the road, away from drought and despair, and towards the “land of promise.” Listen to the sounds of the Big Band era, when the roar of the big trucks and the welcome home cries to returning soldiers dominated the road. Sit at the counter or a booth in the 1950s diner and feel the open road as America’s families vacationed along the length of Route 66. You just might overhear the family’s chatter as they eat their lunch. 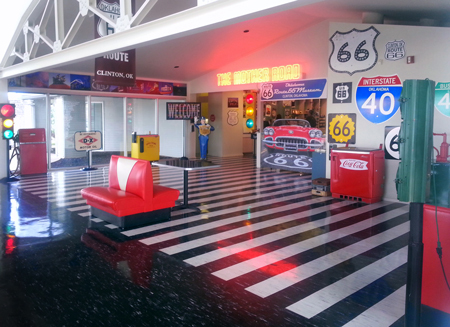 The museum also offers changing special exhibits focusing on the Route 66 experience. Admission fees and gift shop proceeds aid in the daily operations and programs sponsored by the Oklahoma Route 66 Museum. Shop the Oklahoma Route 66 Museum’s online store for books, keepsakes, signs, and more!